I purchased this mower from Sears and it was nothing but trouble. I heard so many good things about Zero Turns that I decided to buy the Craftsman brand again. There was a closeout on it at the end of the year so I took advantage of it. Second cutting of my 2 acres the drive belt fell off and had to have a pulley, belt, and other replacement parts. Top belt came off which I put back on during my third mowing. After breaking down every other time I cut my grass for a total of 6 service calls with less then 40 hours on the mower it was enough to say that's it. Sears gave me heck and refused to give me another one unless I paid the full price. They even picked up my old one and sent me another one but when I went into the store they tried to charge me an additional amount for the new one. Thank God I was smart enough not to use it before going in. After two hours on the telephone with customer care they would not refund my money and told me to go back to the store and talk with the manager. After another hour of discussing this they finally agreed to refund my money. I have been waiting for a week now but no word from the store on when there coming out to get this mower and no check has shown up. 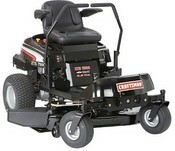 Once I started looking into this mower I seen that many people are having trouble with it also. I recommend not buying it. I did my homework this time and I am going with the Cub Cadet. The extra year warranty, solid frame, easy wash deck, and the required maintenance sold me on this one. I agree with the previous poster. I've had this a couple years and I've worked on it more than I've ridden it. I also asked the same question what good are grease fittings if the bearings are sealed? What kind of rocket scientists are building these things anyway? I'm getting a little tired of pulling the deck off and replacing these bearings. what a piece of JUNK. was told by salesman it is made by husuvarna. BIG LIE! It breaks more than it mowes. Cant get parts from mower shops and Sears is VERY proud of being "the" supplier,took me for $80 just for blades. They have grease fittings on blade arbors BUT HAVE DOUBLE SEALED BEARINGS INSTALLED, so how does grease get in bearing? Correct, it dont! $3400 for a mower & bagger that even the scrap man wont take. I bought the ZTS7500 in 2007 used 20 hrs put it away for the winter. In the spring the deck won,t ingauge it took 6 weeks and cost sears $2400.00 to get it running. My wife kept telling me to ask for a new mower but I trusted sears & briggs, what a fool I was. At 220 hrs the motor completely broke up inside including the casing and its out of warranty. $2800.00 down the hole. They only sold them for a few years and I think I know why, the motor. I went to find out about the 6500 and its gone and they won't tell me why or what powered it. I've cancelled my craftsman membership, Sears credit card, and will no longer purchase anything from sears or briggs & stratton. I've spent $10,000.00's of dollars there but know more.